Gun safes to keep you organized and ready to stop a home invader! 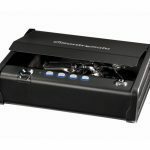 American Security Products makes a back-lit electronic combination safe with a front opening door that fits neatly under most beds. The AMSEC Defense Vault is large enough to fit several long guns on its slide-out, foam-lined tray and allows for quick access. 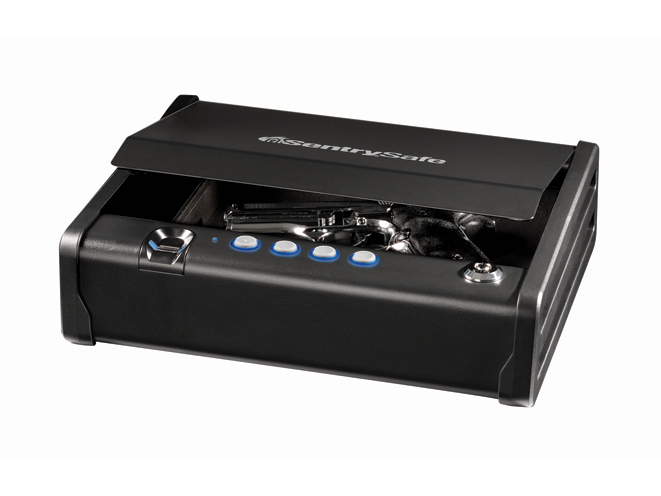 The safe can also be anchored to the floor for additional security. 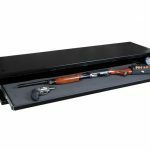 Another reliable option is the TacVault from GunVault, which allows owners of ARs or other long guns to safely and securely store two fully loaded rifles or shotguns in a compact standing safe that can easily be concealed in a closet or behind a door. 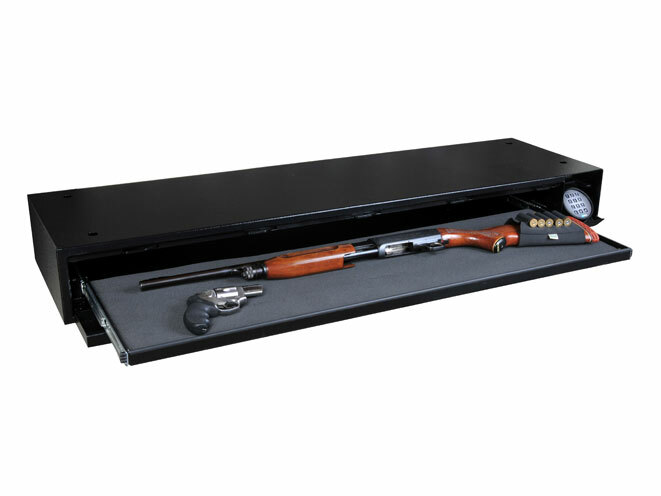 The safe includes a shelf for storing extra ammunition or magazines as well as other accessories. Cannon Safes offers fireproof safes in several sizes, including the 48-gun Commander Series 54, which features a nearly 6-inch-thick steel and composite door with 1.5-inch locking lugs all around. If you are worried about someone stealing the 1,512-pound safe, it can also be bolted to the ground for added security. The Commander provides 90 minutes of 1,200-degree Fahrenheit fire protection to the contents and features internal light systems, power outlets and USB and ethernet connections. The interior is fully shelved and upholstered to accommodate rifles, shotguns and a lot of pistols. The door is secured by a backlit electronic combination lock with three layers of hardened steel plating. The box spring on your bed is really just a lot of wasted space. Now, thanks to the BedBunker safe from Heracles Research, it’s space you could use to store more guns. 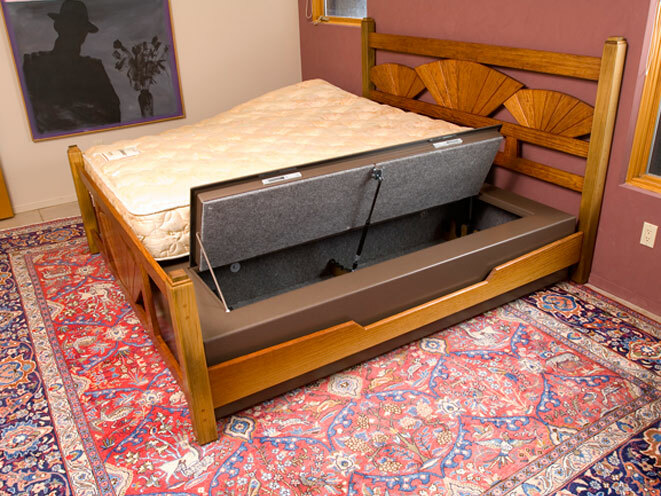 This solid 10-gauge steel safe lets you keep guns secure and hidden under your mattress. In fact, each section will hold as many as 70 rifles and shotguns and 70 handguns on two internal shelves, and you can double the storage space by using two BedBunker units together. 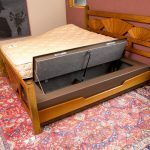 Another hidden safe is the SleepSafe, which looks like a standard nightstand and provides a top drawer (out of three) with fast-access security. This is a complete 2mm-thick steel safe encased in a custom, solid-wood frame to match your décor. 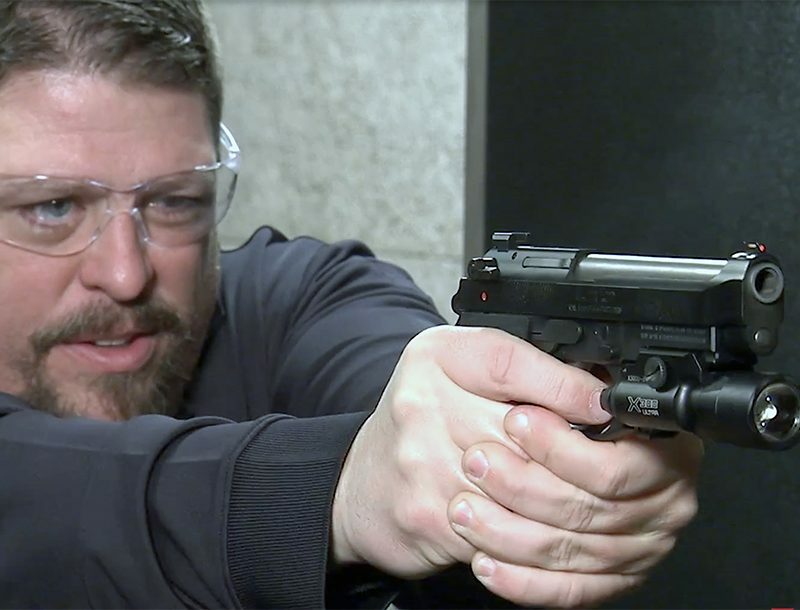 It has a built-in, battery-powered biometric scanner discreetly located on one side that can store up to 10 fingerprints and which pops open instantly for fast access to a firearm. There is no need to worry about power outages given the safe’s internal battery and there is also a programmable code that can be used to gain access quickly. 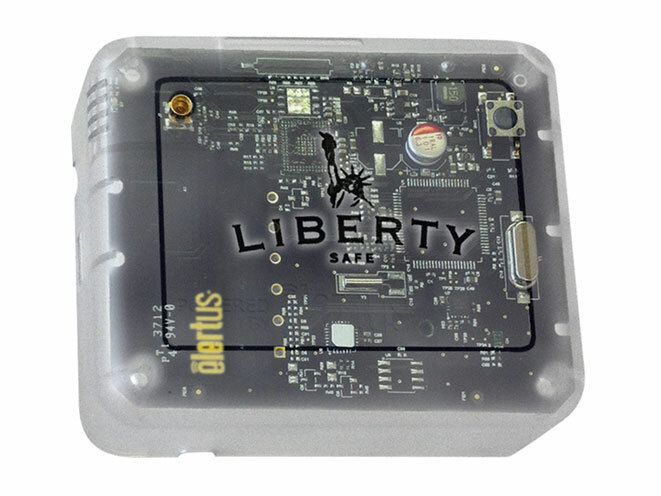 Liberty Safes SafElert Portable Alarm. 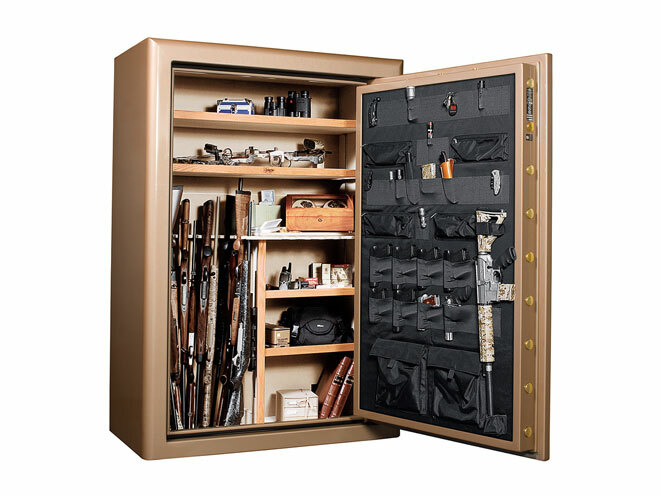 Liberty Safes produces a full line of large and small high-quality safes for firearms storage. But the company also makes safe accessories, and one invaluable tool is the SafElert Portable Alarm. 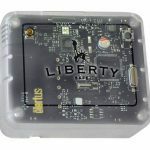 This security tool is housed in a polycarbonate body that looks like a restaurant pager and connects to your Wi-Fi network to send you an alert when whatever you have placed it on or in is tampered with. Personal Security Products offers several everyday items that are actually designed to hide guns. 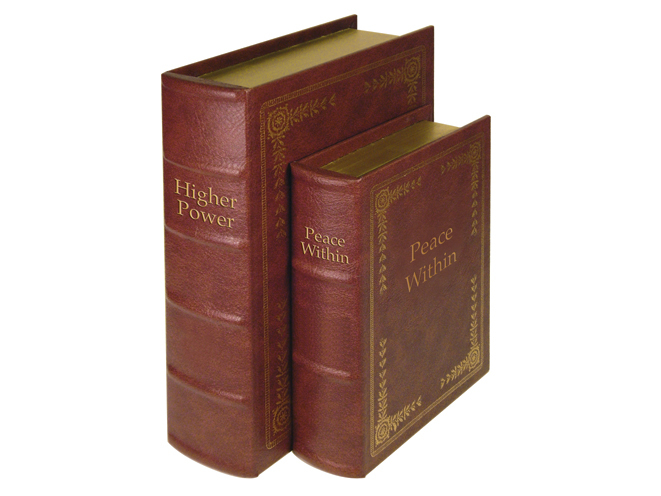 The company’s Diversion Books are two leather-bound books that look great on your shelf. Each one is hollow and can hold either a full-sized or a compact handgun or other valuables. 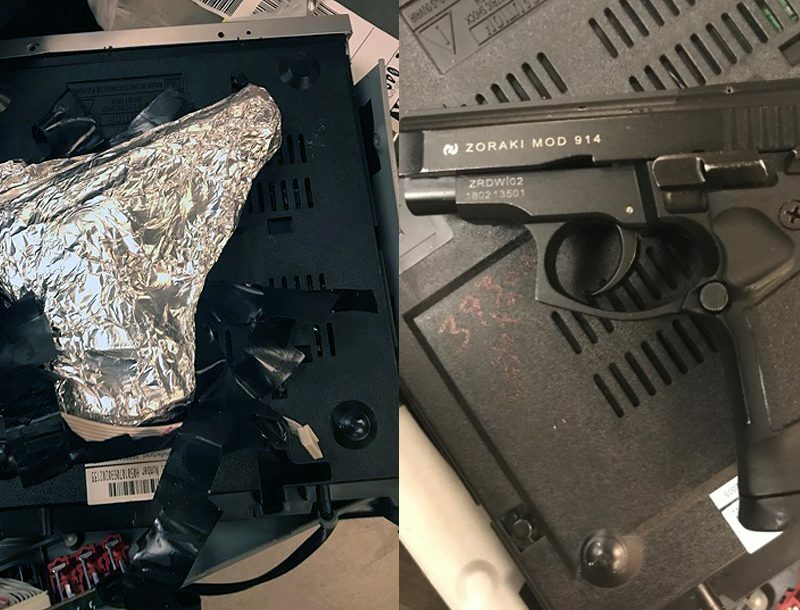 Personal Security Products also has two different styles of lockable mantle clocks that open easily to reveal a hidden gun-storage compartment. 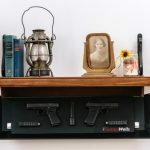 The Concealment Shelves From TacticalWalls mount directly on a wall and offer a decorative touch while securing a hidden gun. The bottom of the shelf hinges downward for fast access. These shelves also feature magnetic locks for added security. 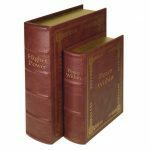 The shelves are made of wood in various finishes and include a customizable foam lining for a perfect fit. Optional accessories include interior LED lights that come on when you open the hidden shelf. 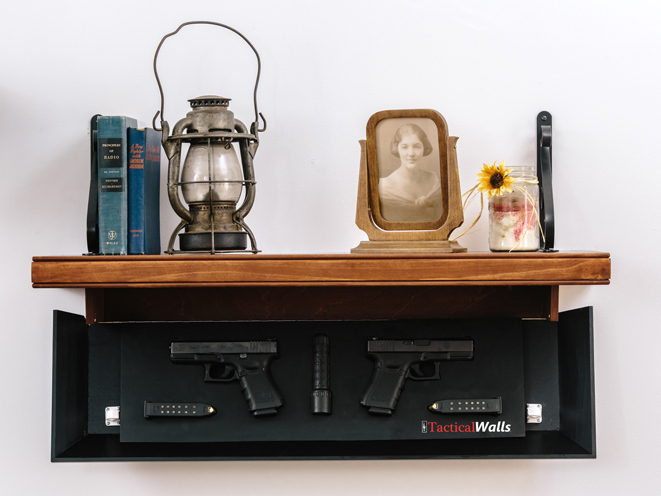 TacticalWalls can help you store, hide, and stage your home defense weapons in several ways throughout your home. TacticalWalls has been leading the way in fast access, concealment, storage systems that won’t break the bank, and look good in any room. The SentrySafe QAP1E is a rapid-access biometric safe is perfect for home defense. 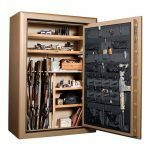 As gun owners, we are each responsible for gun safety, and a large part of that includes safe storage. 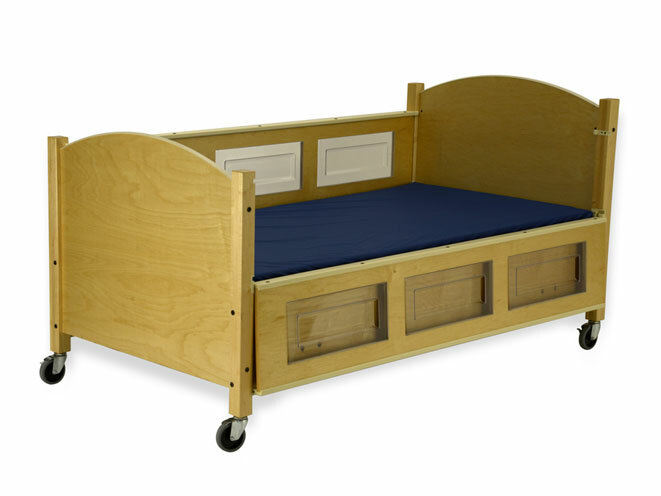 Of course, what constitutes safe storage can vary from person to person. Someone with a large firearms collection and small children at home will have far different needs than an adult living on their own who owns one gun. The amount of space in your home and financial considerations are another factor. There are, however, plenty of choices to meet anyone’s safe storage needs, from basic lockable cases to giant fireproof safes. 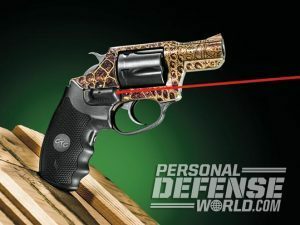 Many people prefer a long gun for home defense over a handgun. Certainly a shotgun or rifle is a more effective fight-stopper than any handgun. In some states and localities, it is also easier to own a long gun over a handgun. 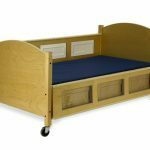 A long gun isn’t going to fit neatly in your nightstand but it will fit under your bed or in a nearby closet, and there are many storage options that offer safe long-gun storage and fast access. The snub-nose Charter Arms Gator packs a .38 Special +P bite!